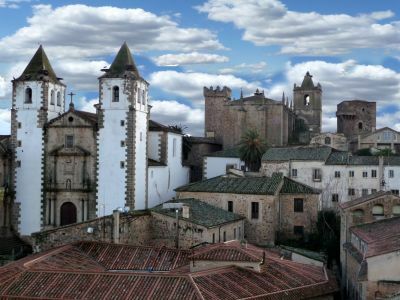 Discover Caceres, a blend of Roman, Islamic, Northern Gothic and Italian Renaissance styles. Cáceres has been a trade route city and a political centre of the local nobles for many centuries. Since ancient times, people from different cultures have gathered in Cáceres and have shaped its strong historical roots. Pre-Roman settlements occupied the original plot followed by the Roman, Arab, Jewish and Christian people. The Old Town of Cáceres is surrounded by a wall of 1,174m, and it’s located in the Autonomous Community of Extremadura in the southwest of the Iberian Peninsula. Caceres is one of Spain's most beautiful cities. While the suburbs of Cáceres are largely unremarkable in the manner of so many Spanish cities, the Ciudad Monumental (Monumental City) at its core is truly extraordinary. Narrow cobbled streets twist and climb among ancient stone walls lined with palaces, mansions, arches and churches, while the skyline is decorated with turrets, spires, gargoyles and enormous storks' nests. Protected by defensive walls, it has survived almost intact from its 16th-century period of splendour. At dusk or after dark, when the crowds have gone, you'll feel like you've stepped back into the Middle Ages.Its Plaza Mayor is one of Spain's most beautiful public squares. Enjoy a half-day guided visit of medieval Caceres a very important city which witnessed the migration of Jews to Portugal after their expulsion from Spain and which played an important role for the Jewish Communities during the 15th century.